Introducing DLease.io - A Digital Asset Leasing Platform for the Masses! Earning passive income is a goal of many but opportunities are few and far between to accomplish this goal. Blockchain technology in conjunction with cryptocurrencies offers a unique opportunity to invest in the future. Especially, when it comes to industrial scale blockchains with a range of viable use cases, utility and first-class leasing and delegation opportunities. 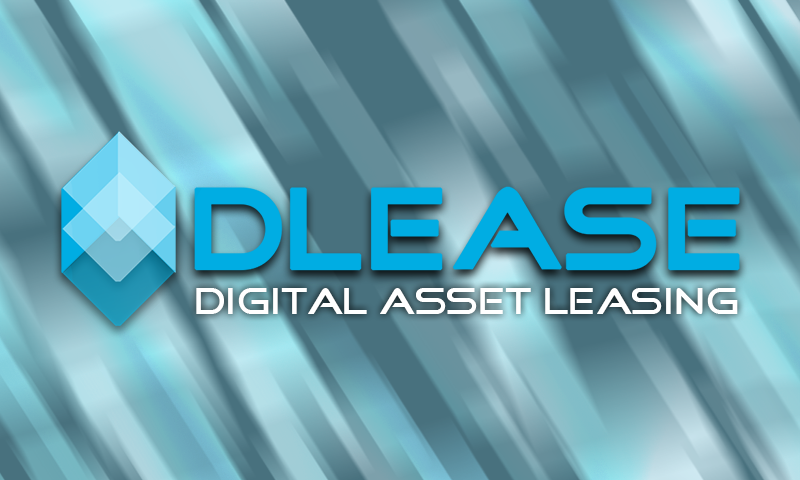 @BuildTeam is proud to announce the official launch of our flagship Digital Asset Leasing service, DLease.io, which is now online! DLease.io is a revolutionary new, professional grade Digital Asset Leasing platform. DLease offers users the opportunity to earn steady passive income, while utilizing the first-of-its-kind token leasing app, enabling lessors to receive dependable daily returns with zero risk of counterparty default and full control of asset ownership and custody, without the maintenance, asset deterioration and administration costs of traditional physical asset leasing. In the case of STEEM Digital Asset leasing, only the resource utility of the asset is revocably leased out and not the actual asset itself. A compelling comparison table between DLease and Real Estate leasing is available on our FAQ page. Confidence in the service's viability can be based on the fact that DLease's predecessor MinnowBooster.net has already filled nearly 20 Million in STEEM POWER (SP) leases since inception, with nearly 2,000 leases active at any given time. Aside from generating passive returns for STEEM POWER stakeholders, DLease is a tool for Steem communities and individuals to rent STEEM POWER resources to meet their transactional and social influence requirements on the network. Large stakeholder status is very expensive to attain for new users who have not been active on the Steem network since its inception in 2016, however leasing a large stake for the utility of the associated benefits will cost a fraction of the price via short-term leasing on DLease.io. DLease delivers an amazing user experience as demonstrated by the personal 'Dashboard' page, where you can find important details about your account and your leasing statistics. Beyond that, it gives you real-time control and monitoring of your outstanding leases. 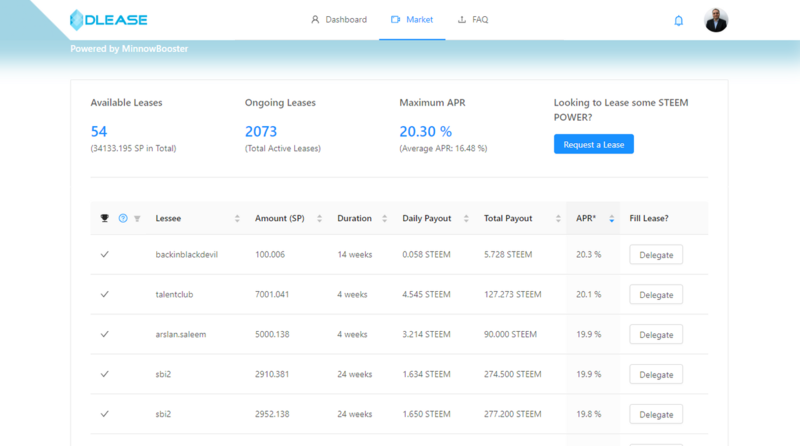 For example, you can see who you have delegated to, the amount of STEEM POWER delegated to each individual user, the APR you are receiving from your lease delegation, the total time the lease has been active and even when it expires for planning purposes. There is an Expired Leases tab with a counter to alert you when there is action to be taken to cancel your delegation and a full History tab showing your lease history, inclusive of your MinnowBooster.net leasing history. With the DLease user dashboard, you can see all the necessary metrics to keep you in the driver's seat! Easily find who you've delegated to, how much you've delegated, the APR % you are receiving on your delegations, how long they've been active and when they expire! Everything you need to know to keep your operations running smoothly! 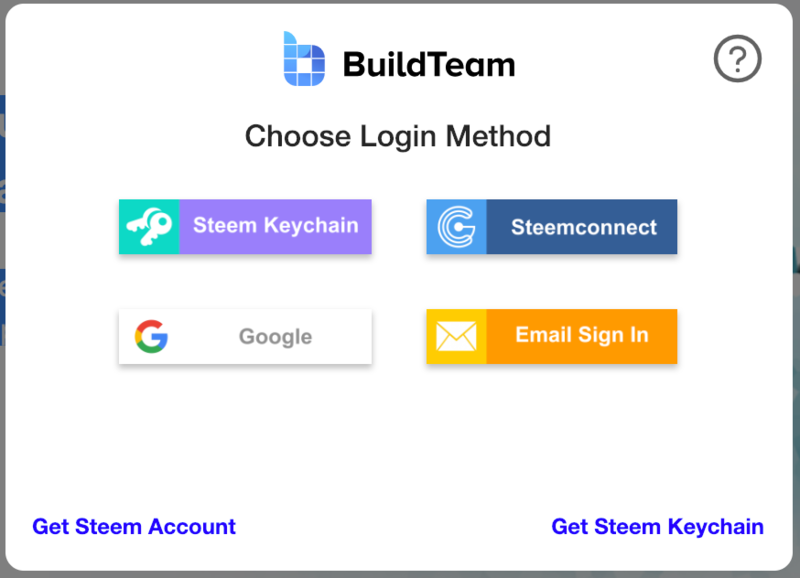 The Universal BuildTeam login also facilitates sign in to various other BuildTeam apps in our new App Store. You can be assured that DLease is secure and has been heavily tested as it runs the same backend architecture engine as the well known, trusted and battle-tested MinnowBoooster.net service that BuildTeam has operated since 2017. Memos will currently be received from the @minnowbooster Steem account until DLease gets its own dedicated engine. Look for future updates coming soon, this is the first release candidate phase and we still have many features and optimisations to come. Our next task is to make DLease responsive for mobile, please bear with us while we get that done. Help us spread the word about DLease.io the innovative new Steem app with external investor appeal! Go to DLease.io today and take it for a spin! Find DLease in the BuildTeam App Store! This is a @steemvoter subscription payment post. Thank you to Steemvoter customers for allowing us to use your Steem accounts to upvote this post by virtue of your free subscription to the Steemvoter.com bot service. @steemvoter is proudly a @buildteam subsidiary and sister project to @steemsports, @dlease, @tokenbb, @ginabot, @quicksteem, @minnowbooster and @minnowmonsters. I want to give you instant feedback. As a regular customer who has done more than 50 leases through minnowbooster, I want to tell you that the process of leasing feels a lot more intuitive on the minnowbooster page. What is especially annoying is the three pages you need to fill, to request a lease. Having all info clear on one page only, feels a lot better because you can't change the amount of sp requested while having filled out the rest of the form. That is super annoying. And the option to show the amount of sp available is missing. Cool thanks for the feedback, I’m giving you a 100% upvote with whatever remaining unleased SP I have cause you just echoed exactly my thoughts on it, and this comment helps me motivate the change internally. I propose the first popup be to choose the account, the second screen maybe shows the round avatar in small somewhere, and the available SP next to it. Thanks! I'm glad that you also think that the parameters should be on one single screen. I don't see what the improvement is by dividing the account and the available Steem on your account from the rest of the leasing parameters, but I'm ok with that as long as the leasing parameters are on one single screen, so that you can easily adjust (and play with) APR and wanted SP . Sure no problem I have given the instruction and we will amend to have the params on one page. The reason to have different screens is to have the wizard look and feel for new users so that they aren't bombarded with so much info on one go, hence increasing their cognitive load. I call BS on the "so that they aren't bombarded with so much info on one go" thing, because every shopping site has more info on it, youtube and fakebook as well. But I understand that you are just trying to improve the overall user experience and that this is not even close to the final version of the dlease homepage. With minnowbooster you did hundreds of small improvements over time as well. I like the idea though of having a neat and clean, professional looking page without the cartoon style, which may not be to the liking of professional investors. The rebranding is a good idea for future growth in my opinion. How does dLease differ from Minnowbooster's DLM? Just a rebrand and reskin or is there more to it? Rebrand and reskin, with better filtering and delegator stats and full Steem Keychain support for all features. The entire app is aimed at external investors, free from quirky Steem/MinnowBooster branding. In the next few months it will have its own node.js engine on our microservices infrastructure at which point we will deprecate the leasing features from the monolithic Ruby on Rails MinnowBooster app and redirect all leasing to DLease. The only difference users will see at that point however is a memo coming from DLease. But since this frontend is native React, there is a wider base of developers that can work on it as opposed to Ruby and will be able to roll out loads of new features quicker. We currently have a bounty available for making the frontend responsive for mobile. That's a very nice upgrade! The speed and ease of use with Steem Keychain is really insanely cool! I have yet to install it, will have to soon I guess, noticed steem-engine has it as well but not steemconnect. Keychain has changed my steem life for the better - especially since I have more than one blog here. I hesitated and now I am annoyed when I have to use steemconnect somewhere. Keychain is so much quicker and easier. Will this ultimately replace the leasing side of Minnowbooster? Should we start looking toward dlease now instead of Minnowbooster? It look beautiful so congrats! Hi @newageinv, yes we will be doing no further development on the @minnowbooster leasing module and eventually it will redirect to dlease.io. We would like everyone to start using DLease going forward. I am a little concerned about what will happen to our current Leases on Minnowbooster. Plus I don't see any delegate to the BOT option. Since we run the same backend, current leases are not affected at all. Delegation to the bot is handled via the minnowbooster interface. Hi @arunava, both products use the same backend so what you see on MB is the same as DLease, in future when DLease has it's own engine, MinnowBooster leases will run until expiry, and all new leases will be created on DLease, that is however about 3 months away. The delegate to bot feature will remain on MinnowBooster as DLease focusses on the P2p leasing aspect. Good luck! Mobile version of the website has some text blocking issues. Ill check u guys out soon, minnowbooster was a good resource for posts i valued that i wanted to promote. Heya, they Mobile version is not optimised at all as mentioned in the post, we have a bounty out for that. This is a big improvement! i really like the fact you are now given an average APR return on all leases, this is something i have previously wondered. I cannot see the service charge anywhere - where can i find this please? Hi, the service charge is 10%, same as MinnowBooster, I have been wanting to add that to our FAQ. But the APR's shown on the market are nett of service charge and 5 day delegation cooldown anyway, lessors are basically choosing leases based on advertised return and imo showing fees isn't necessarily important, but we should add it to the FAQ. I can make the post in Spanish. clear with your permission. @lanzjoseg, you are most welcome to make a Spanish post. Gracias por la oportunidad. apenas lo publique lo hare saber. Thank you for the opportunity. As soon as I publish it, I'll let you know. 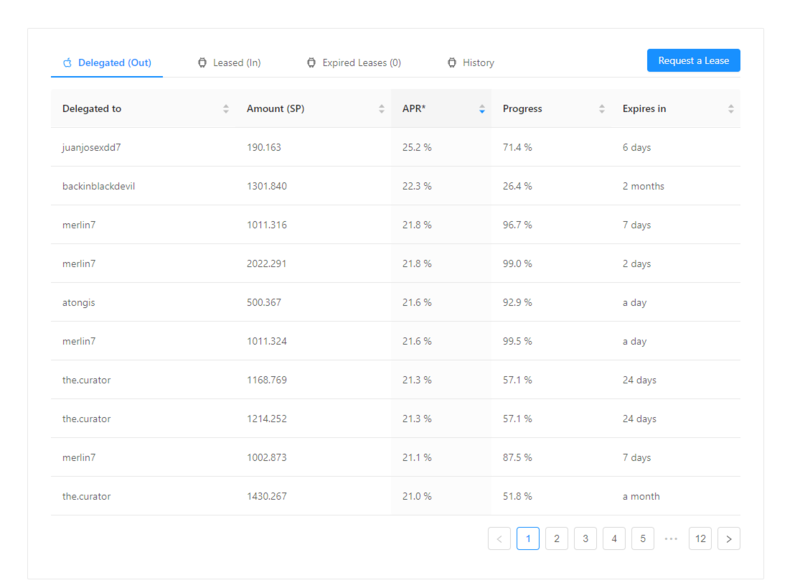 The formula for the average APR is fairly simple, take for example the above dashboard example of daily payouts being 115.847 STEEM for total of 201,959.981 STEEM POWER leased. Now we know that STEEM is 1:1 with STEEM POWER. Next we annualise it 115.847 x 365 = 42,284.115 STEEM per annum / 201,959.981 STEEM POWER x 100 = 20.94%, which is what the dashboard shows as the average APR. But it seems you don't take into account the powering down period after each time a delegation ends? My profile shows: Average APR: 27.65%, but I don't have even one delegation that has such a high APR? @frankvvv, you are correct, I just realised that now that you have said it. The individual lease APR is correct as those take into account the 5 day cool down, but the overall portolio APR is therefore overstated as you rightfully pointed out. This is very useful feedback thank you! We will fix this in the next day with a stake weighted average of all the individual leases. It has all the reason is very simple. Sola would change the factor as there is a new investment from that moment. What happens with that Sp that grows as SP is won by Healing Voting. I don’t understand, can you rephrase? My question is: What happens with the Delegated SP? Example: I have SP that was delegated to me, for several dynamics that I do to support Venezuelans like me. I have noticed that SP grows as I earn SP for healing, that would happen the same with the SP that I rent. Example I was delegated about 250 SP a year ago and the same was growing every time I received SP for cure reached 260 or so. Ah yes so SP grows in two ways, when you vote content and other people validate your vote for the content by voting alongside you, then you all earn a share of 25% of the post reward as curation, the person with the largest vote gets bigger share. Then there is an interest rate that is earned on SP, roughly 1.8% per annum, this is not well advertised, but it happens. I hope you like the work, with the translation in Spanish. Presentamos DLease.io - ¡Una plataforma de arrendamiento de activos digitales para todos! Thanks so much, I appreciate it. I'm not sure how accurate it is, but looks good though. That AppStore page is really nice, can't wait to see it grow bigger and bigger! Glad you like it, be sure to favourite it and check in every now and then to see what's new. This seems to be one of the better, long-term and professional opportunities available on the Steem blockchain. I'm grateful to have stumbled across this post and I look forward to following D Lease and eventually participating in a lease of my SP. Thanks! Looking pretty slick, great work guys!! Having checked it out, I still prefer the minnowbooster interface. Much clearer to see everything. I think one of the reasons is because dlease is not using colors like Minnowbooster does. We can look at introducing subtle colours, this is a first release so plenty of room to improve. It means in future dlease will be upgraded leasing side of minnowbooster? How does work Dlease's security. Can we trust like steemconnect? It uses Steemconnect as well as steem keychain for the operations, so at no time you have to give us your keys. In future, users will just be redirected to DLease from MInnowBooster, but DLease needs its own engine first, still is 3 months away. You can choose to use Steemconnect or Steem Keychain which is said to be safer because all your keys are locally encrypted. Every service sends memos, even memos when you power up or post comments like esteem and partiko do on introduceyourself posts such as this, take into consideration we have not done any memo advertising in the past for any of our services and this is the first time, we need to be able to compete and we have acquired the correct RC's and resources to do it, the delegation for RC's is from our @buildteam account and not from our customer delegations. Welcome to Steem dlease! Partiko is officially the fastest and most popular mobile app for Steem. Unlike other Steem apps, we take 0% cut of your earnings! You can also be rewarded with Partiko Points while using Partiko and exchange Partiko Points for upvotes! You are welcome.. I will surely spread this to the world of blockchain. ..Since this frontend is native React, there is a wider base of developers that can work on it as opposed to Ruby and will be able to roll out loads of new features quicker. 🖕It’ll benefit Steemers who value investment! Just renewed a lease coming due in 3 days. Very cool. Thanks @dlease. 🖕That’s an awesome improvement. It’ll benefit Steemers who value investment! I feel like this is the best long-term and professional opportunities available on the Steem blockchain. And am very happy to have come across this post and I have already followed dlease and i look forward to participating in a lease of my SP. Thanks! Please do not use transfers for spamming.